Coloradans work hard and play hard – and USAFact is no exception to that rule. Driven to become simply the best employment screening firm in the nation, the professionals at USAFact headed outdoors for some fresh air and inspiration centered around their latest software release, slated to be unveiled in late Q4. 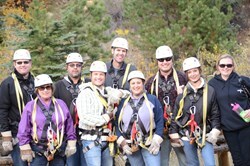 USAFact Operations, Sales, and Tech Managers spent an afternoon with the Colorado Adventure Center in Idaho Springs. The employment screening management team zipped over 3000 feet on five zip lines - the longest being over 1200 feet over Colorado's legendary scenery. The team passed through treetops, over Clear Creek’s roaring rapids, and even rode the zip course built over the historic mining claims where gold was first discovered in Colorado. Taking leaps off of Colorado Adventure Center’s 65-foot towers set the stage for an additional 2 days of leadership and strategy meetings. Successfully operating in the background investigation field for over 36 years, USAFact has been recognized as the hiring solution provider which delivers the most accurate, up to date, and thorough background screens in the industry. As a leading online pre-employment screening service, USAFact combines the latest Internet technologies with the expertise of an experienced professional staff to deliver a proven resource to thousands of clients, processing thousands of reports daily. Offering a variety of screening packages for businesses of any size, from the small non-profit to Fortune 500, USAFact provides services custom-tailored to their individual needs. For additional information on USAFact’s products and services please visit http://www.usafact.com, or call (800) 547-0263.